I'm the odd man out on Tom Ford's Private Blend line. I like a few of them, but by and large they strike me as not nearly so interesting or well-done as the (aspirational) prices might imply. I waited a good long time to try them at all, and when I finally worked my way through the initial twelve 2007 releases, the only one I really wanted to own was Oud Wood, and it was easy enough to control that lemming given that Yves Saint Laurent M7 is cheaper and easier to come by. Since then, there have been nine new additions to the line, including the four fragrances in the pleasant but comically overpriced White Musk collection. Arabian Wood is one of the later additions. It was reportedly created for a "a well-known Arabian sheik" (ok) and was originally exclusive to the Tom Ford boutique in Kuwait. In 2009, it was unleashed unto the world at large, and in keeping with my usual pace, I'm getting around to it about a year later. 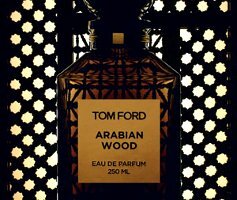 Arabian Wood is very much in keeping with the others in the Private Blend collection: it's rough and loud, and quite different from the smoother, more polished (albeit also sometimes loud) fragrances in the "regular" Tom Ford Beauty collection — Tom Ford Black Orchid, Tom Ford For Men, White Patchouli and Grey Vetiver. The opening is heavy on the galbanum and lavender (other notes: Bulgarian rose, freesia, orange blossom, bergamot, rose de mai, ylang ylang, rose absolute, jasmine, gardenia, honey, orris, patchouli, cedar, oak moss, sandalwood, tonka bean and amber) and is a bit screechy, although if you adore galbanum as much as I do, it's screechy in an enjoyable way. The dry down is a woody chypre, with the rose dominant among the floral notes. It's dense and slightly powdery, and leans somewhat towards the masculine. It is meant to capture "the mystique of Arabia", but it smells like a classic green chypre as much as anything, and as such, calls up older mainstream designer fragrances rather than exotic locales — in other words, it isn't unusual so much as out-of-time, and while I have often bemoaned the loss of the chypre category, this particular entry doesn't feel like a step forward. My advice: if you want something that captures the mystique of Arabia, ante up a few (ok, many) more pennies and go for one of the Amouage attars (Homage is gorgeous; I have not tried Tribute), or perhaps better yet, find a good purveyor of traditional Arab attars, and then tell the rest of us all about it. Tom Ford Private Blend Arabian Wood is available in 50 ($180) and 250 ($450) ml Eau de Parfum. For buying information, see the listing for Tom Ford under Perfume Houses. Maybe it’s my nose, but I don’t find this one LOUD at all. I have and own this and don’t get complaints. You know, the “UCK! Your perfume is so STRONG” complaints. Now montales on the other hand…they ALWAYS get the complaints. BTW…meant complaints by my co workers. Oh, no…they’re definitely not as loud as the Montales, and this one in particular is not nearly as loud as a Montale oudh. All the same, to me, Tom Ford’s style is essentially brash, and this fragrance, while far the from loudest in the PB collection, is not about nuance or subtlety. And of course you are free to disagree even with that! So I admit it, I was a BIG Tom Ford Fan Club Member when the 1st 12 were released. Since then, many of the newer PB releases haven’t really wowed me. But, I happened to LOVE Arabian Wood. Not enough to buy a full bottle, but enough that it’s left an indelible impression on me since I tested it last year. I think your suggestion for someone who’s interested in a scent like this (at these prices) to try Homage is a GREAT idea. AW is a bit more diffusive than Homage, but of course the Amouage is so much more rich & deep. I am looking forward to sniffing Tom’s newest PB Azure Lime, although most of the comments on Basenotes I’ve read do not sound promising. I think a lot of people loved AW…wasn’t kidding when I said I was the one who was the odd man out! Kevin is reviewing the lime tomorrow, but haven’t yet seen the review so don’t know what it says. It’s funny, but I get the reverse effect from the Private Blends vs the commercial line. I find the PBs much smoother than the others – frankly, Black Orchid scared me for a while, and now that I have tried it I find it tooth-cracking sweet. I will give it a fair shot, of course, but I have tried Tom Ford for Men, Grey Vetiver, Black Orchid and the Voile de Fleur version, and have not fallen for any of them. I have fallen for a few of the PBs, though, and split a bottle of the Oud Wood, which does an amazing thing on my skin. Bois Marocain and Champaca Absolute are my next favorites, although CdG Ourzazate (sp?) is a nice stand-in for the Bois Marocain. They are somewhat loud, but I think my chemistry really likes them. And, yes, they are stupidly pricey, but I like to think that it all balances out in the end. This one intrigues me, so I will try it. I already have scents that make me feel like I am in some deserty country, like Maroc pour Elle and l’Air and that Mecca whatever I got from Daisy, so maybe I have enough in that category. This one, to me, is not at all like all of those other “deserty country” scents…it really doesn’t call up anything like that for me. More like a green chypre, and a green chypre that isn’t quite as good as the classic green chypres. Bois Marocain is the one PB I still haven’t tried, other than the new Azure Lime thing. EL Private Collection, Chanel 19, Ma Griffe, etc. Bois Marocain has already joined and left my collection. Burns off the skin in like 10 minutes. Wow! Amazing for something called Bois Marocain. Wow – lasts a long time on me! I thought bois marocain smelled a lot like 10 corso como. dont even bother with azure lime. Thanks for the clarification – I think I get galbanum and labdanum mixed up and forgot galbanum was the green one. I could control my desire to try this until I reached the words “heavy on the galbanum.” Luckily, there are still so many other green chypres to try that I can wait on this one, in hopes of finding a cheaper one. I just can’t pay his prices for the PC’s. I’ve been known to blow ridiculous amounts of money for no apparent reason, but I arbitrarily draw the line here. I liked Oud Wood (although it’s hard to say that you like something when you shower it off half an hour later–but I did, I liked it) and the tobacco vanilla one. I just don’t feel like they’re *quite* worth the price. But most any green chypre is going to be heavy on the galbanum…although this one is particularly shrill about it. I might like shrill. I do love the galbanum. You know, I read your original comment backwards…and so thought you were contradicting yourself. Duh, sorry. I will have to try Tribute then…I loved Homage, but way too spendy for me. Thanks for the review, Robin. I remember liking AW very much when I tried it at NM back in the winter. I sniffed a bunch of TFPB that day so I can’t remember anything specific about it, except I’m sure I didn’t find it too loud. But I did make a mental note that I liked it and that I should try it again…and snag a small decant from a split if one ever materialized. The notes do sound very appealing. It is so nice that these are all at NM now — much better than having to jump through hoops to get samples. I tried this one at the same time as Bois Marocain and Oud Wood so I’ve got them all mixed up in my memory. All I recall is that one of them was intensely cedar-y (BM?) but none left an impression otherwise. Regarding the Private Blend vs main line – I did think that Noir de Noir was a lot like Black Orchid but better done. I found it far less jarring, better worked out and generally more palatable than BO. And a lot more expensive, of course. This one is not intensely cedary, so is probably the Bois Marocain? And I don’t feel that way about Amouage either, although I do like some of those much better than others. When I discovered Arabian Wood I thought “Oh, Private Collection on steroids”. Or was that “surgically enhanced green chypre”? Nothing Arabian or particularly woody about this, and while I enjoy a good green chypre and quite like its heavy-handedness, I’m with you on that Robin: I don’t quite see what it brings to the table. Again, I know I’m the odd man out because a lot of people love them, but I don’t see what any of them bring to the table….even Oud Wood is not what I’d call massively unusual. I do see why many people love the Tobacco Vanille, and perhaps I’d feel differently about the whole line if they’d gone much slower…too many of them are just not up to par with other things at the same price range. Well, the one I did buy was Velvet Gardenia because it was just so outrageously decadent. There was no other gardenia like it on the market. About the others, I agree: to me some of them just seem like fragments taken from other perfumes. But as you say, there were just so many to take in all at once, which is always the problem with those big collections that pop up: you just flit from one to the other and nothing stands out. I should try VG again…did not grab me the first time, but I know lots of people love that one too. What a coincidence, I was at Nordstrom today and found myself trying these PB’s (not for the first time) because I am really trying to decide if I want to buy, and which ‘wood’ is the best out of these? I too at one point I had them all mixed up, and still do. Oud Wood seems brash (good adjective Robin), Arabian Wood nothing special, Bois M perhaps the one for me. Tried Japan Noir for the first time on paper and kind of liked it. Hated Azure Lime because it smelled (on paper) like every other mainstream in this category. My fave is still Noir de Noir, though I would purchase V Gardenia if I wore this sort of thing (I think T Sanchez gave it relatively high marks) or lived in Hawaii, and think Tobacco V is up there with all the other good tobacco scents ( of which there don’t seem to be many) but don’t yet want to commit to smelling like tobacco. So, all in all I basically asphyxiated myself with Tom Ford Private Blend today, and find it perfect that Robin reviewed this! Sounds like a fun day at Nordstrom…my Nordstrom does not have them, sadly, although my Neiman’s does. Wonder which one is the best seller, I’ll have to see if I can get someone at NM to tell me. The fragrance guy in the men’s department at my NM (which is where I got to sniff TF because the TF rep in the *regular* fragrance department is waaaaayyyyy toooooo pushy), said that Neroli Portofino is the most popular one he sells from PB, but that Oud Wood is also popular. Thanks so much!! That is funny — I mean, the neroli is nice, but there are lots of nice nerolis that don’t cost so much. I have very similar preferences. And Bois Marocain is my only FB. I’ve heard that too, but haven’t seen them yet. Only certain ones, Tobacco Vanille being one for sure. I’ve been experimenting with arabian attars from all sorts of places and there’s just no end to how many complicated beauties one can find thereof, usually for cheap prices. Twould be quite a task for somebody to start reviewing that. One wonders if the perfume industry would hurt less if lines like PB were mainstream, price and distribution, rather than the stuff we’re assaulted with all over the place. But then again, a lot of people buy by if-it’s-expensive-it-muf-be-good standard. It’s hard to say which ones I love most because I’ve only tried some and then my taste keeps changing. I’d certainly love to take sweetlife’s advice and send you guys a bunch of samples to sniff. Some are, I suspect but am unsure, from Nemat. Some have unknown origin. If you send me an email or a shout out on MUA I can pack a bunch next week. I’m sure you have more samples than you have time and skin to try but I really don’t trust my judgment and would prefer to send them over. You guys have more to skill compare too. I have a lot of samples…it’s like a black hole over here. But would love to try them if you really want to send them — you can email me at robin at nstperfume dot com. Hey Robin! I tried this some time ago (thank you, Tama) along some other PBs. I remember liking it, but never enough to shell out the 180 clams for it. It’s well done, and I think I’m like Carlos in thinking that it was sort of a softer wood — nothing near as harsh or loud as some Montale ouds, for example (though I like several of those too). I don’t have broad experience with a lot of Tom Ford fragrances, but I actually think Black Orchid is genius (though verges on way too sweet and timing has to be right). The Voile de Fleur is nice, but I haven’t sampled it enough. As far as the Private Blends, I’m glad I have a decant of Tobacco Vanille. I would definitely also pay the price for a decant of Champaca — I think it’s a wonderful tropical extravaganza. The others I’ve tried… often nice enough, but way too expensive. Urban Musk was the quirkiest of the white musks, I think. Duh. In reading Tama’s comment, I just realized that the ones I’ve tried are Bois Marocain & Oud Wood. I don’t think I’ve sampled this one. I figured…this one really doesn’t compare to the Montales at all, it’s just not the same thing. Agree about Black Orchid! My guess is that considerably more time was spent on the development of BO than on the development of any of the first 12 PBs. Living For and Loving the Tom Ford, But Tres Uber PISSED that the company decided to pull out of selling the line in the Major Stores here in Michigan (I.e Saks, Neimans, Nords….) What’s The Big Idea TF? think us Michigan Rubes aren’t sophisticated enough to get the whole LUXE Fragrance Line? well i am hear to say that at Saks the Clive Christian Label sells VERY WELL and they are 3 times as expensive and Niche! so now if i want to smell one of them before i buy, i can’t because the closest place is Chicago or New York, I cry BS! shouldn’t have to travel a few hundred miles for a darn fragrance because the company can’t sell it in all the stores in a chain. PHOOEY! But are you sure if wasn’t the stores’ decision? Many stores won’t carry lines that don’t sell. you make a good point, but i know for sure, from the woman that was the sales rep for TFPB at Neiman’s that TF pulled it from that store, not the other way round, she didn’t know exactly why, but that the decision was made against her protestations! so, As for Saks, they never have carried it, and Nords… well same thing, so just disappointment all around. Well, it’s too bad regardless of how it happened, sorry! Great review Robin and I’ve been curious about this one too. I really like the Private Blends and am probably bucking the trend here but find them intruiging and well made and thus perhaps justifying the higher price point. Even though some of my favourite houses – the L’artisans, Malles (ok, maybe not so much the Malles but there’s one or two there I like) and the Le Labos, etc. make great scents I can never really understand why they’re so expensive. For me the TF PB seem to have so much presence and personality. Who knows, maybe one day I’ll win a lottery and be able to afford a couple of bottles! I’m kind of surprised that you’re the odd (wo)man out on this. I didn’t realize I was so odd & out, too I loved the scents TF oversaw for Gucci and YSL, so I was initially very excited about the Tom Ford line – but have always found it a disappointment. There are two I kind of like, but would never spend the money on buying a bottle, which I think are Noir de Noir and Black Violet. If I was a big gardenia fan, I’d like VG, and Amber Absolute was also well-done, if not at all my style. Several friends are big fans and the SA at my local place is very persistent, but I just don’t get the appeal – and the two longest-standing local fragrance fanatics kind of feel the same. We’ve have a few conversations of a “is that all there is to a fire?” sort…. E, my comment on smelling the first few was that they smelled like unfinished mods for other fragrances…but obviously this style appeals to many others, just not us!